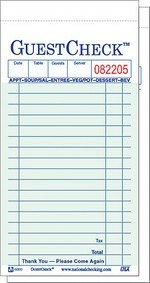 Single board green GUESTCHECK(3.50" x 6.75") has 15 lines with a Menu Prompt for better customer service. Lined back copy for beverages and a perforated receipt for the customer's record. 50 checks per book / 50 books per case. 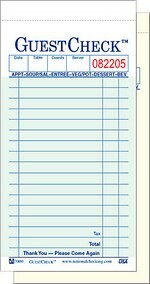 Duplicate paper, interleaving carbon green GUESTCHECK(3.50" x 6.75") has 17 lines with a Menu Prompt for better service. The kitchen copy is unlined. 50 sets per book / 50 books per case. 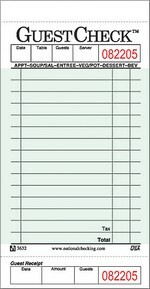 Duplicate paper, carbonless green GUESTCHECK(3.40" x 6.75") has 17 lines with a Menu Prompt for better service. The kitchen copy is unlined and printed on yellow paper. 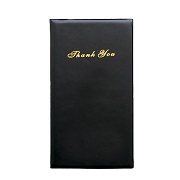 A wrap-around cover prevents write-through. 50 sets per book / 50 books per case.